Taking the family relationship one step further, this latest reality project features children spending time with their grandparents. Veteran Actors Im Ha Ryong and Im Hyun Sik look after their grandchildren, Im So Hyun (6) and Kim Joo Hwan (5), respectively. Actor Choi Ro Woon (Good Doctor) spends time in the country with his grandmother. As a single working mom, David and Isabel’s mom relies on help from her parents so that she can work to support her multicultural family in Korea. Actor/Halbae Shin Gu narrates. This is another case of a successful show forcing other networks to find similar projects that will be just as successful, if not more as the initial one. The first episode premiered a couple weeks back but I have not continued to watch this show for a number of reason unrelated to whether this show is good or not. Simply put the show is about children with their grandparents. The show feature a variety of household dynamics and situations but there does not seem to be a consistent flow between the stories. As much as I respect watching Im Hyun Sik and Im Ha Ryong figure out the ups and downs of taking care of their grandchildren, those scenes seemed a little forced. It’s like the show needed more star power and the kids, who are not used to being on TV, seemed a bit inaccessible. On the flip side, the good thing about that is you get to see the real side of their relationship but in terms of TV entertainment that material comes off as a bit dry. As for David and Isabel, I’m not sure how they were casted but I did find the working mom concept of the show to be interesting. The grandparents have already done the parenting by raising the mom but in their twilight years they are doing the child rearing all over again. It’s not clear whether the multicultural family dynamic will be emphasized in future episodes. While it’s not a topic that needs exploration, it’s a description that was used over and over again in many media reports that makes me think they will approach it as some point. Finally, there’s Choi Ro Woon and he is my favorite out of the entire cast. 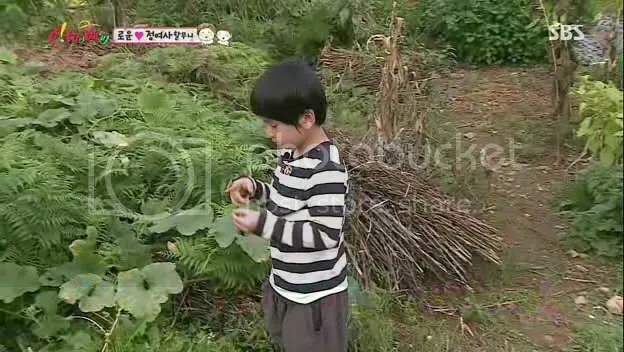 I think the fact that many viewers know him as Little Joo Won as he played the Young Park Shi On on Good Doctor, many of us already have that connection with him. From this first episode, he’s seem bright and delightful. That’s probably due to the fact that he’s used to cameras being around him and has a natural ability to entertain. I can’t believe he knows Trot Singer’s Sul Woon Do’s songs at the mere age of 7. I mean, I don’t even know those songs as Sul Woon Do belongs to my parents generation. It’s just icing on the cake to see this precocious kid help his grandmother, eat fried grasshoppers and harvest potatoes. The thing that doesn’t work for me about this show is that all these familial stories are separate and removed from one another. If these kids interacted with each other, it might be a different story as the stories might create an arc. Part of the show is lighthearted and fun, while the other is real and serious; and the editing doesn’t do much to transition between the fluctuating emotional tone of the show. The bottom line is that there is already another show out there about kids and their family which makes an emotional connection and provides entertainment so I can’t really see why it’s worth keeping this program on my watch list. Where can i get this variety show (oh my baby episode 1)??? This variety show started in 2013 and ended in 2016. I believe some of the final episodes may still be on On Demand Korea. Unfortunately, there are no subs. I know that there are short clips that SBS still has up on Youtube so you can try there and see if you can find 2013 episode excerpts.